Models-3 is developed by US EPA in the 1990s aiming for both regulators and scientists. Models-3, is rather a flexible software framework more than a specific air quality model developed for a specific air pollution problem. Models-3 and its Community Multiscale Air Quality (CMAQ) modeling system forms a powerful third generation air quality modeling and assessment tool designed to support air quality modeling applications ranging from regulatory issues to science inquiries on atmospheric science processes. 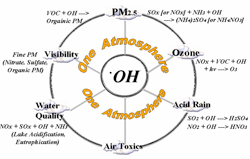 The CMAQ system can address tropospheric ozone, acid deposition, visibility, fine particulate and other air pollutant issues in the context of “one atmosphere” perspective where complex interactions between atmospheric pollutants and regional and urban scales are confronted. With projections for the increasing rapid pace of the development of computational capabilities at the start of the nineties, the opportunity arose for a strategic review of modeling approaches leading to design of a system that would both meet and keep pace with the increasing requirements on air quality modeling, of incorporating advances in state-of-science descriptions of atmospheric processes, as well as eliminate impediments of the current genre of models. The scope of such a system that processes great and diverse information from complicated emissions mixtures and complex distributions of sources, to modeling the complexities of atmospheric processes that transport and transform these mixtures in a dynamic environment that operates on a large range of time scales covering minutes to days and weeks. The corresponding spatial scales are commensurately large, ranging from local to continental scales. On these temporal and spatial scales, emissions from chemical manufacturing and other industrial activities, power generation, transportation, and waste treatment activities contribute to a variety of air pollution issues including visibility, ozone, particulate matter (PM), and acid, nutrient and toxic deposition. The residence times of pollutants in the atmosphere can extend to multiple days, therefore transport must be considered on at least a regional scale. NAAQS requirements and other goals for a cleaner environment vary over a range of time scales, from peak hourly to annual averages. These challenges suggest that more comprehensive approaches to air quality modeling are needed, and that assessments and pollution mitigation are achieved more successfully when the problems are viewed in a “one atmosphere” context that considers multiple pollutant issues. The structure of the Models-3/CMAQ system is shown in figure 7.4.3-2. 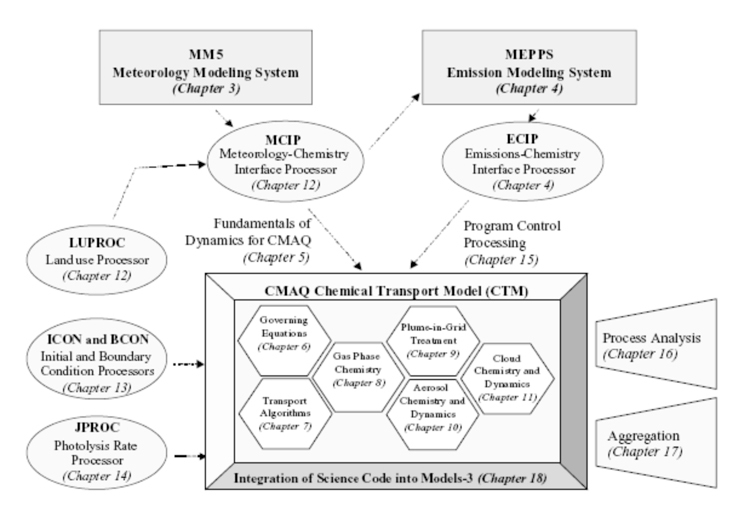 Orchestrated through the Models-3 system framework, the Community Multiscale Air Quality (CMAQ) modeling system incorporates output fields from emissions and meteorological modeling systems and several other data source through special interface processors into the CMAQ Chemical Transport Model (CCTM). CCTM then performs chemical transport modeling for multiple pollutants on multiple scales. With this structure, CMAQ retains a flexibility to substitute other emissions processing systems and meteorological models. One of the main objectives of this project was to provide an air quality modeling system with a “one atmosphere” modeling capability based mainly on the “first principles” description of the atmospheric system. 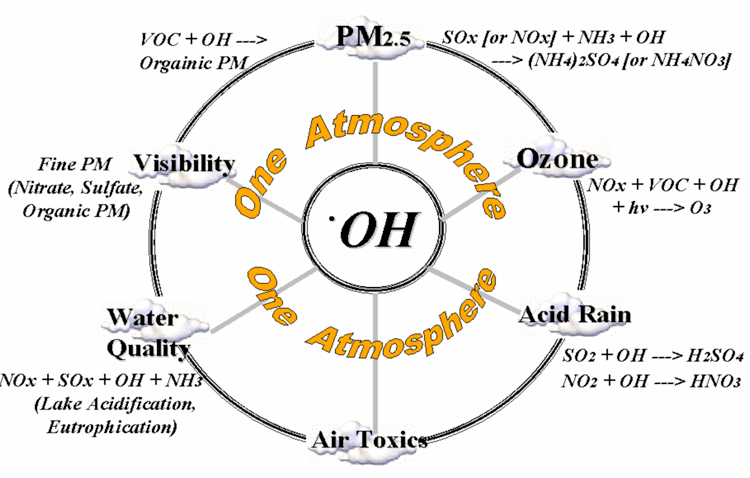 CMAQ contains state-of-science parameterizations of atmospheric processes affecting transport, transformation, and deposition of such pollutants as ozone, particulate matter, airborne toxics, and acidic and nutrient pollutant species. 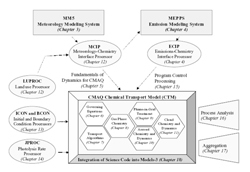 With science in a continuing state of advancement and review, the modeling structure of CMAQ is designed to integrate and to test future formulations in an efficient manner, without requiring the development of a completely new modeling system. 1. The Emission-Chemistry Interface Processor (ECIP) translates data from the MEPPS emission model for use in the CCTM. ECIP generates hourly three-dimensional emission data for CMAQ from the separate source type files produced by MEPPS, which include mobile, area, and point sources. ECIP calculates the plume rise and initial vertical plume spread of point source emissions to determine the vertical level(s) of CCTM into which point source emissions should be introduced. Since meteorological conditions affect both point source plume rise and biogenic emissions, meteorological data from MCIP is also used in ECIP. 2. The Meteorology-Chemistry Interface Processor (MCIP) translates and processes model outputs from the meteorology model for the CCTM. MCIP interpolates the meteorological data if needed, converts between coordinate systems, computes cloud parameters, and computes surface and planetary boundary layer (PBL) parameters for the CCTM. MCIP uses landuse information from the landuse processor (LUPROC) to calculate the PBL and surface parameters. 3. Initial Conditions and Boundary Conditions (ICON and BCON) provide concentration fields for individual chemical species for the beginning of a simulation and for the grids surrounding the modeling domain, respectively. The ICON and BCON processors use data provided from previous three-dimensional model simulations or from clean-troposphere vertical profiles. Both the vertical profiles and modeled concentration fields have a specific chemical mechanisms associated with them, which are a function of how these files were originally generated. 4. The photolysis processor (JPROC) calculates temporally varying photolysis rates. JPROC requires vertical ozone profiles, temperature profiles, a profile of the aerosol number density, and the earth’s surface albedo to produce the photolysis rates for the CCTM. JPROC uses this information in radiative transfer models to calculate the actinic flux needed for calculating photolysis rates. JPROC generates a lookup table of photo-dissociation reaction rates. Each of these CMAQ interface processors incorporates raw data into CMAQ and performs functions such as calculating parameters and interpolating or converting data. Raw input data is currently specified in the source code for JPROC, LUPROC, ICON, and BCON. However, the interface processors in future releases of CMAQ will be modified to handle a more generalized set of raw input data, so that alternative data sets with varying resolutions or measurement units can be used. The CCTM simulates the relevant and major atmospheric chemistry, transport and deposition processes involved throughout the modeling domains. The science options available to the user include the gas phase chemistry mechanisms, RADM2 and CB-IV, a set of numerical solvers for the mechanisms, options for horizontal and vertical advection schemes, algorithms for fine and coarse particulate matter predictions, photolysis rates, and a plume-in-grid approach. Through the Models-3 framework, CMAQ simulations can be developed using these different options without modifying source code. A general overview of these science process options is provided below along with a reference to the science documents of Models-3. In the form of module, the scientific understandings and system computational capabilities, as embodied in the modeling framework, will be evolved significantly to meet the needs of air quality modeling applications as soon as possible.